A powerful storm took place in Northern California this Monday caused by atmospheric rivers, which are also responsible for up to 65 percent of the western USA’s extreme rain and snow events. Atmospheric rivers are ribbons of water vapor in the sky that are visible thanks to clouds. These weather formations can be miles long, as they expand from the tropics to zones like North and South America. These flying rivers carry all the fuel that makes possible the composition of massive rainstorms and subsequent floods, the report, which appeared in the peer-reviewed British journal Nature Geoscience, stated. However, according to recent investigations, atmospheric rivers are not trouble for North and South America only, as they are responsible for 75 percent of the extreme precipitation events that are registered worldwide. Western Canada, Northern Europe, and New Zealand are among the places where atmospheric rivers occur 35 days per year. Even when the research team recognizes how important these rivers are, other consequences must be studied, said study lead author Duane Waliser, an atmospheric scientist at NASA’s Jet Propulsion Laboratory. In the last year, Europe has suffered the consequences of atmospheric rivers significantly. The lead author said that Europe experimented 19 storms last year, where these formations caused 14 of them. They cost up to $20 billion in damage to public and private property. 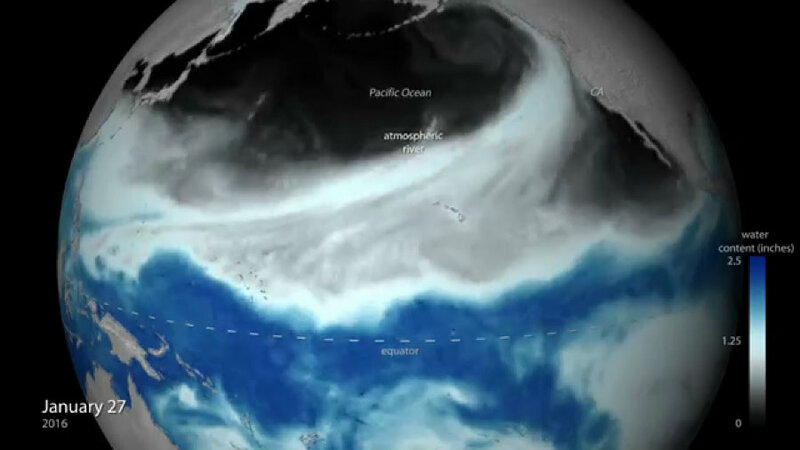 The new research presented this Monday challenged a long-term scientific fact: Atmospheric rivers not only are extremely water-charged, but they also produce massive air mobilizations through the globe. The investigation took place outside tropic areas, ergo, at mid-altitudes. For two years, the scientific group led by Waliser was in charge of analyzing all the data registered by National Oceanic and Atmospheric Administration, among other weather agencies. The study showed that is not wrong to think that these formations are very wet, as these flying rivers can carry the amount of water that is within the Mississipi River in its mouth. However, according to the analysis, the acceleration of the winds registered in the study was at least twice that the ones recorded in storms. Waliser explained how this discovery must be shared among emergency responders worldwide. Last year was a perfect year to study atmospheric rivers as it was a very active year in that aspect, states Jeff Zimmerman of the National Weather Service. He said that only during the winter, at least ten atmospheric rivers were registered in the United States. Scientists explain this abnormality by remembering the influence that the “La Nina” phenomenon produces in the weather conditions worldwide. According to the research team, more investigations will be conducted as they are interested to know in which specific areas of the world atmospheric rivers are more common.